Note: Since writing this post we have had a second gender reveal party, and we came up with even more gender reveal party games! So be sure to check that out after you finish this post! When I was trying to plan for our gender reveal party, I googled "gender reveal party games" to see what would come up. The results were somewhat disappointing. There were no actual articles on games for gender reveal parties, and most of the results were just recaps of gender reveal parties on personal blogs that had minimal game ideas. This isn't technically a "game", but I saw the voting board idea on several blogs and decided we'd do it too. We had the guests vote for what they thought the baby was, and write there name on the appropriate side of the board. We also had them pin on a pink or blue ribbon to represent their guess. This is how we split up the teams for the rest of the party. There was "Team Blue" and "Team Pink" competing against each other in other games, which worked out rather well - the competition makes the party more interesting, in my opinion. We bought pink and blue jelly beans, counted them out, and put them in a jar; then we added a few more jelly beans of the color related to the baby's gender. 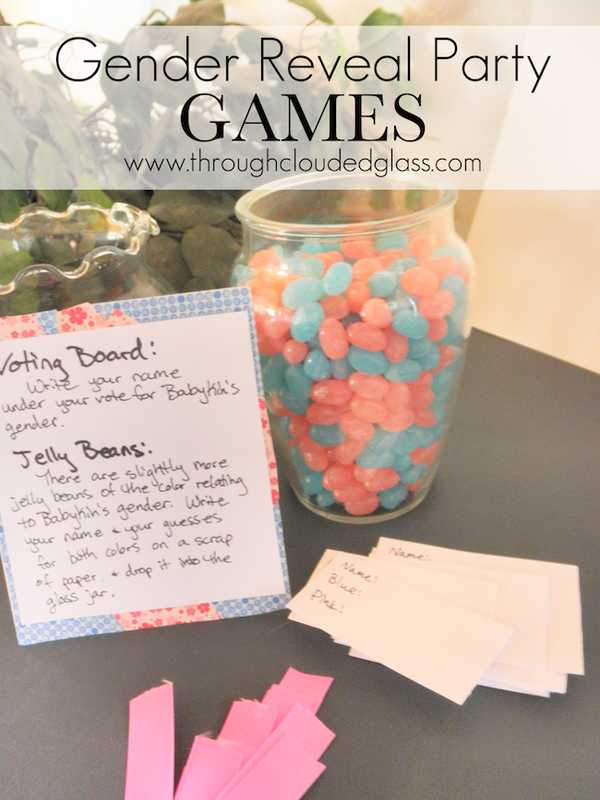 We told guests as they arrived that there were slightly more pink or blue jelly beans depending on the baby's gender, and then we had them write their guesses for both colors on a piece of paper and put it into another jar. It was fun to see people examining the jar, trying to figure out which color had more jelly beans. After the reveal, I went through the papers, and we awarded one prize for the person who guessed closest to the amount of pink jelly beans, and one prize for the person who guessed the closest to the amount of blue jelly beans. We decided to give away $5 Starbucks giftcards for this game, since there were only going to be two winners, but any prize would do. You could also only give a prize to the person who guessed the correct amount of the correct color, but we just thought we'd give prizes for both. I went through all the cards in our Junior Outburst game and pulled out the cards that had to do with boys or girls. Then we played a short game of Outburst with the Blue Team vs. the Pink Team. I think if you want to have the cards you read be related to boys and girls, the junior version of Outburst works best. You don't necessarily have to use only the boy/girl cards though - I just felt it helped the game fit into the purpose of the party a little better. We gave mini candy bars to the team who won - even though it was a really small prize, I think it was just fun to win something. I got mini Hershey bars for this prize, and I colored the "HE" and "SHE" in "Hershey" blue and pink accordingly, and everyone thought that was a nice touch. The beauty of doing the Team Blue vs. Team Pink thing is that you can pretty much do any team game and fit it into the party. Since we had alot of men coming to the party, we wanted to think of a game that we knew they'd like. And all men love Nerf guns. If you doubt me, just giving a couple of Nerf guns to the men in your family for Christmas, and see how long it takes them to start shooting at each other . . . So, once again, we split into Team Blue and Team Pink, and did a shooting competition using Nerf guns and empty pop cans. Each person got five shots at five pop cans. We then recorded the amount of pop cans each person knocked down on a dry erase board, and when everyone had a chance to shoot, we gave the team with the most points a prize. This game seemed to be a hit - the women and men both had fun seeing how many cans they could hit. We just gave out mini candy bars again, so it doesn't have to be a big prize - just give them something to win. They way we chose to do our reveal moment also became a sort of game. Weeks before the party, when I was trying to think of a creative way to reveal the gender, my husband came up with the idea of using a pinata. I thought that was a brilliant idea, so that's what we did. I originally thought I could just buy some pink or blue candy and let the breaking of the pinata be the reveal - but then I started wondering where I was going to get pink or blue candy in the fall. If it was Easter time when we had the party, this would be no problem, but the time of year made it hard to think of where to look. I was considering buying some pink or blue cellophane and wrapping regular candy in that, which would have worked fine - but then we came up with a better idea. I decided to just use regular candy, but to tape a little card on the back of one of the pieces with the gender inside. Then the person who found the candy with the card on the back could be the person to reveal the gender to everyone else. We also decided to award a prize (a $5 Starbucks giftcard) to the person who found it, as a little added incentive. It turned out beautifully, I think because it got everyone involved in looking through the candy. With most of the guests being adults, I didn't think there would be much of a desire to gather up the candy after the reveal moment if we just did pink and blue candy. But alot of our guests did rush to the candy when they had the chance to find the revealing piece of candy! My sister found the candy with the card and was able to read it to everyone. 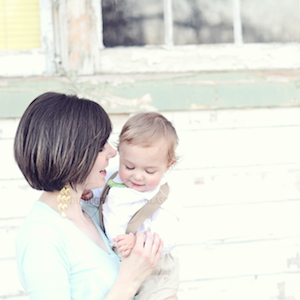 I think it was fun to give someone else the chance to announce our news, instead of Derek and me announcing it. The team that guessed the gender right at the beginning of the party also received a prize after the reveal. We did full-size candy bars, because everyone loves candy and they weren't too expensive to buy. They went over very well, I think. Any small prize you'd want to give away would do - just make sure you over-estimate the number, because you never know how the teams will be split. It took alot of planning, but we wanted to give the guests something to do at the party, besides just eating and visiting. The prizes we chose to give away added a little excitement and competition to the games, and were also part of our "Thank you" to our guests for coming. Many of our guests told us how much fun they had after the party, so overall, I think the games were a success! Actually, I think I would have guessed "boy". Of course, it's easy to say that now. But it really feels right (which is just as well!) that you're having a boy. And I hope you enjoy "The Centurion's Wife". It's SO good! I love the ending - it'll have you wanting the next installment, which picks up a few minutes after the first ends! Those are great games, Callie! I'm glad everyone had fun and that the party was a hit! This sounds like so much fun! I love all the ideas - so creative! Loved your game ideas Callie!! Your party looked like SO MUCH FUN! Love this! What adorable ideas you had! YOUR POST IS ADORABLE. WHERE DID YOU ORDER THE MINI CANDY BARS? What did you write inside the notes on the candy that wasnt the gender?